It's getting tricky now to keep Jack interested in this project. This is the 4th week we have been working on it, and it's getting to the "wrap it up" stage. 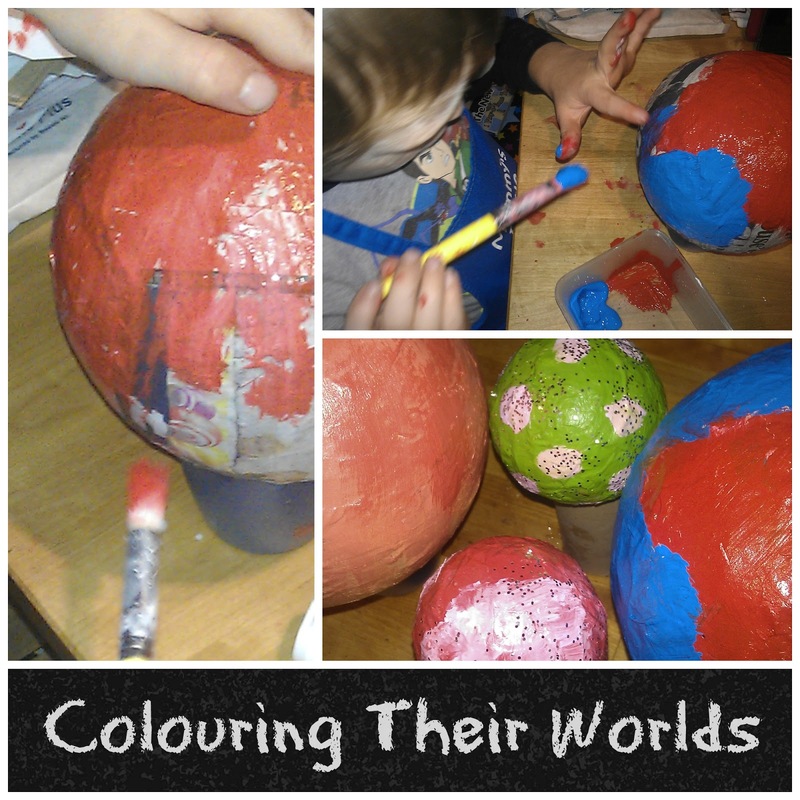 Although, to be fair, he's done really well and was excited about painting his planet this weekend, even if that is as far as we got. He's getting fed up of waiting for things to dry, saying it feels like that's all we've done. He's itching to get it finished and take it all the school for the last week before the holidays. Tom enlisted Daddy to help paint his balloon a kind of coral pink/orange colour, Jack painted his red and blue and had me help cover up some of the "tricky" bits. They look fab. They are very different from each other. Tom's could almost be Mars with it's colouring and carefully bended edges. Jack's is very striking with a large vivid red continent brightly contrasting against the blue of the ocean. The next stage is to coat them both in green glitter glue (I kid you not) because this will make them look like alien planets! And then there is the construction of the rings for Jack's planet. AND the painting of Apollo 11. We started that this weekend by painting the long balloon white and taking another good look at photos of the real one, ready for detail painting! We're not waiting for next weekend to do these stages though, we're going to squeeze them in after school though the week. Next weekend is the LAST weekend for this project - and also coincides with the release of Skylanders Swapforce - you can pretty much guarantee there will be no school work done next weekend! So if we don't have it done by Thursday night, it's not getting done! And I'm not having that! I'll share"Part 5" next week. Hopefully it will all be finished and that will be the last one for this half term.